It's never a good sign when you spend most, really all, of the book hoping the romantic interest is either killed or the killer. That indecisiveness is a reflection of how I feel about Sink Trap, it is an okay book and at times I even liked it, so, is that a two star rating or a three star rating. The book was quite repetitive, reminding the reader of the lead protagonist's former career, the secrets that led her home, her martial arts expertise and of her candy red 'Vette (I officially hate this word now) at least five times too many, once really is enough sometimes. 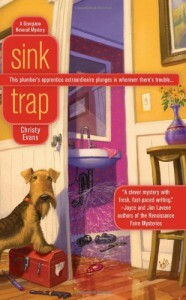 The characters were a mostly interesting set but as I read I couldn't help but notice the similarities in characterization between this book and other series mysteries - a little Charlaine Harris, a little Susan McBride, a little Sarah Graves, etc. I suppose those that don't spend a great deal of time reading cozies wouldn't notice the familiar characters, albeit with different names and faces, but I did and it became a game of sorts for me. There was a mystery but the book seemed to stall for great lengths of time, I was a reader running in place wondering when we would start getting some clues and when the investigation would begin in a fashion that was less bumbling and half-hearted. There are some series introductions that I read and know I'll never read another, such is not the case here. I'll read the second just to see if the dust settles, so that makes this a three-star read - just barely.